6-Figures every month on complete Auto-Pilot! Don't believe me? Check out the VIDEO PROOF above! If you can spare 10 minutes of your time, watch how I made $40,000 in 3 months using the "manual" method of reselling ONE digital product; and how I now generate $100,000+ per month, using my new “Automated” method of reselling hundreds of digital products with just 2 mouse clicks! This video will prove to you just how profitable resale rights are. If you don't have the time to watch this video, don't worry. There is a shorter & more exciting video further down the page, of how an Alpha Tester made OVER $400 in less than 24 hours reselling digital products on AUTOPILOT using my incredible system! I've been reselling premium eBooks, videos & software programs for over 7 years now, and I know for a fact they're the HOTTEST way to make money on the Internet today! As you can imagine, all of this is quite time consuming and very expensive. HOWEVER... the main issue I personally find myself running into is...LIMITATION! I can only target a few niches at a time and resell a limited number of products "manually". As a result, I actually lose out on many many potential sales each and everyday! Your virtual store can generate up to 6 streams of income! No programming skills or knowledge needed! The ADE System allows you to resell over 1,000 of premium products on complete AUTOPILOT! As a result, this Turnkey Solution will free up so much of your time; thus allowing you to target more markets, sell more digital resale products and most importantly - maximize your profits! As you seen from the video above, I sold one product "manually"... and generated an income of $40,000 in just 3 months. 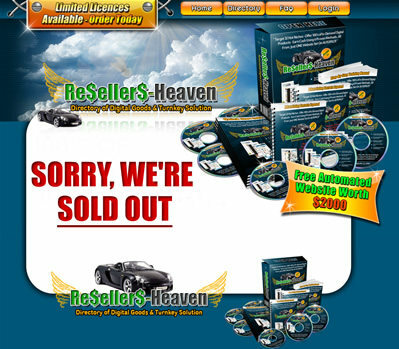 One year, and thousands of dollars later, Resellers-Heaven has taken Reselling Digital Products to an "automated" level, allowing you to duplicate and multiply my $40K income...into an even greater amount - just like I did! 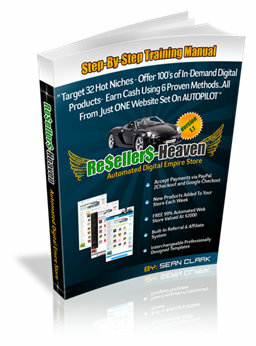 This automated web system actually connects to Resellers-Heaven Directory, which is a directory of all the digital products that I personally resell online; and imports these products straight into your very own Automated Digital Empire Store - with the click of TWO BUTTONS! 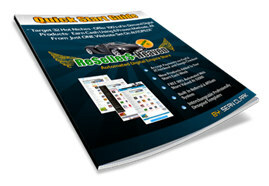 Our Search Engine Digital Directory is the original service that I began offering my members. 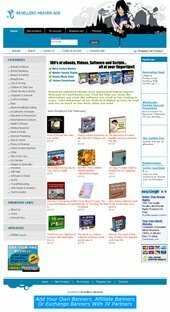 It is composed of 32 HOT categories/niches, each filled with eBooks, software, scripts, videos & much more. The Directory is purpose-built for those who resell digital products "manually". 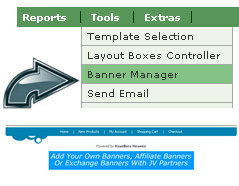 The majority of the products contained in the directory are ones that I have sold manually and found very profitable. 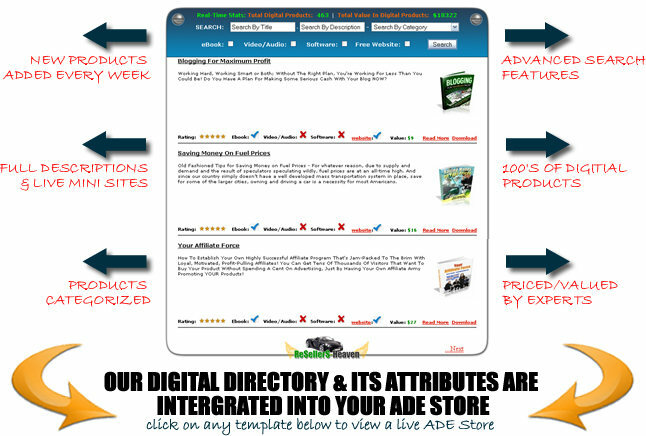 Believing that automation is key, I have integrated many of the Directory's features into the ADE Store. This enables you to import all of the containing products, and their attributes, into your store - instantly. Look at the diagram below for a more visual understanding. Not only have we strived to make reselling digital products easy & fun, we have virtually automated the entire process for you. No HTML knowledge necessary, no need to research hours on end to decide which product(s) to resell, and most importantly...no more wasting YOUR money! 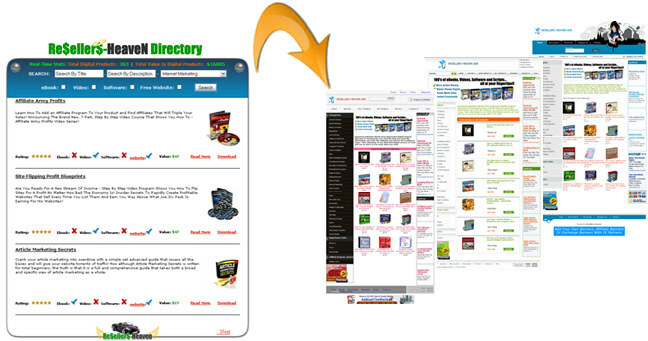 By developing this custom eCommerce solution, which connects to Resellers-Heaven Directory, you are able to provide your consumers with new, high quality, high in-demand products every week - which puts more money into your pocket. We have developed a true "business in a box", allowing you to earn 6 streams of income from just one web site!...enabling you to focus all your efforts on marketing your new, highly converting resale store. AND... I'll even show you the same advertising methods that I use - Piece of cake! We add, on average, 20 new products to our directory each month. These new products are imported into your store, keeping your web site fresh and up-to-date, which has been proven to increase direct sales due to repeat customers. I have just finished the site configuration (took me 10 minutes) and I must say I found your video tutorials to be the best in the industry for getting set up. This is truly one of the few online purchases where downloaded instruction required no support calls to get my site up and running - well done! I've launched my 1st ad campaign I have already had my first customer. I hope your product will lead to many more. Thank you! 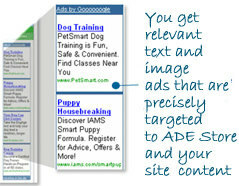 The ADE Store has been purpose-built to convert all traffic into revenue! The main goal is to resell digital products & earn $13,000 per month. However, we want to maximize your income. So after quite a bit of research, and common sense, we found that on average only 5% of targeted traffic will make a purchase. So what happens to that other 95% of traffic?... They just leave your site! I made it my mission to turn that exiting traffic into revenue!... Hence the 5 additional streams of potential income! Choose to own their own ADE Store like you! Whatever your visitors choose to do, they will not leave your site without putting money into your pocket!! Resellers Heaven has put together an awesome product! One, that after less than a week gave me my first sale... I haven't looked back since! The site set-up instructions were so easy to follow that I'm sure anyone could do it. After-all, if I can – anyone can! Now that it's all set up and sales are coming in (kinda like magic), I only have to spend about 20-30 minutes A WEEK on it – and that's just fine with me! This is truly a no brainer for making a great profit online – with VERY little work! I highly recommend Resellers-Heaven ADE stores to anyone willing to put in that 30 minutes of work each week when new products are delivered! Thanks for the opportunity and for a great product! Soooo...we found our very first Alpha Tester back in 2009, who was more than eager to test the very first version of the new ADE System! In less than 24 hours of her store going live, she made $400+ in pure net profit! Check out the video below to see her ADE Admin Account and PayPal Proof. Resellers-Heaven is a dream come true for me! I’ve always wanted to supplement my income but didn’t want the demand of more hours in another work setting. I’m a self taught computer user and found this opportunity! This has worked out very well for me. I had my 1st sale on the 2nd day I was up and running! It’s all here…at your fingertips! I’d advise anyone with an interest in ecommerce to give Resellers-Heaven a try! Have New Products Added To Your Store On A Weekly Basis...On Complete AUTOPILOT! Built-In Affiliate System - Recruit Affiliates To Sell Your Products For You! Start Your Own ReseLLER Business Online Store Today!! As you know the ADE Store has many advanced features, which give you full control of your Virtual Shop. Even though this system is pretty straight-forward, and user-friendly, I wanted to create a Step-By-Step Training Manual. This will ensure that novices, & even experts, won't get lost. You can download this Manual from your account as an eBook. If you want you can even print it off, so as to make for easy referencing. I know know the majority of the Beta Testers will be new to this. Therefore, I have written a 55 Page Step-By-Step Manual! However, this is so easy you most likely won't even need this manual! This Quick Start Guide will no doubt get you where you need to be, and fast. I actually recommend that you read this eBook first, before reading the Training Manual. 4. The Essential Store Settings To Configure To Be Up & Running ASAP! The Videos will cover all aspects of your ADE Store - and is great for those of you who are visual learners! There are currently over 4 hours of video training recorded, with many more tutorials to come. 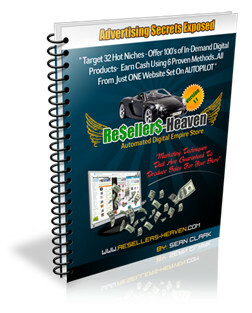 The "Advertising Secrets Exposed" eBook is CLASSIFIED, and EXCLUSIVE to Reseller-Heaven Members only. You will not find this eBook on any of my other sites. It has been created for ADE Store Owners ONLY! The eBook covers not one, not two, but 7 HOT advertising methods that I use, which will guarantee you SALES! 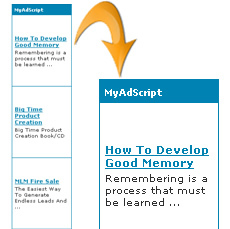 - "Advertising Secrets Exposed" eBook that will explode your online sales! This is a "Beta Tester" offer. We only need LIMITED people who are eager to own an ADE Store and are willing to provide us with their feedback for our official release. As a result we want to give you everything shown above, absolutely free. 20 ADDITIONAL PLACES ADDED FOR ONLY. THIS IS YOUR LAST CHANCE! $97 Only! 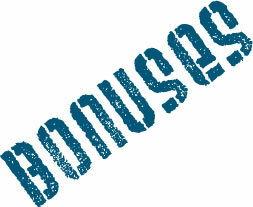 There are no additional & no hidden costs, and we have 100% Money Back Guarantee! This program is designed to work for YOU! You can use the actual products yourself too, as each product is of high quality and will most definitely enhance your online business! 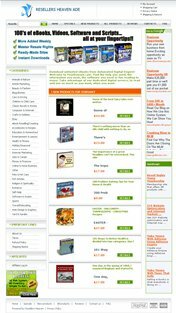 Your virtual store can generate up to 6 streams of income - Save $685!! HOLY CRAP! SOMEONE IN INTERNET MARKETING THAT TELLS THE TRUTH AND DELIVERS WHAT HE PROMISES! What a great opportunity you have created here! As an Alpha Tester I have been super impressed with how everything has worked so well from day one. You have provided me with an admin section that's been a pleasure to use with the help of your excellent instructional videos. If this is only the pre-release, I'm really looking forward to the complete version. Keep up the good work! Once you have fully tested the Beta Version, we would appreciate if you could provide us with your reviews and comments, so as to make the Official Release better for you and future ADE Store Owners. The ADE Store will be launched officially sometime in the summer, costing $685. So SAVE yourself close to $700 and be one of the lucky few people who will own this powerful "business in a box" at a bargain price - and no doubt be on your way to a 6 figure income!!! 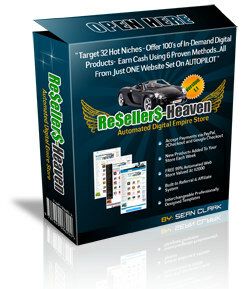 How Much the Resellers Heaven Digital Store? What is the Monthly Sync Fee? 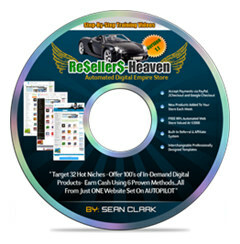 The Monthly Sync Fee is FREE, will allow you to market any Resellers-Heaven products in the directory. Is the Monthly Sync Fee mandatory? Of course not. This is an additional service designed to help automate your ADE Store even further, thus allowing you more time to focus on other aspects of your new store. 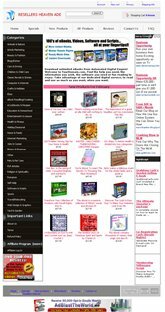 At your request, we will also import all of the current products within our Directory, to your site, for one time only. For example, if you paid the one time activation fee today, and we had 700+ products in our directory, at your request those 700 products would be imported to your store. Why do you give everything for free? We add approximately 40 new high quality products to your store every month. Each of these products cost anywhere from $10-$100. Once I have purchased the products, I must pay my staff to manually add these products to the directory so that you can import them to your store. The small Sync Fee helps cover these costs. Please remember, as a Beta Tester you are saving $700! If you delay any further, your chances of securing a BETA TESTER position, will be ZERO! In fact, the page below is what you will see once we have enough beta testers! This ADE Store is a very powerful system, which I can see has the potential to generate a great income for anyone, who gets the opportunity to use it! 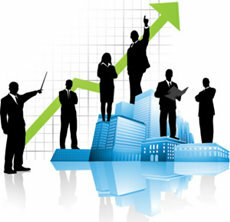 own professional online business. Not to mention the countless advanced, yet easy-to-use features, which give the end-user full control of their web store - without having to learn any html.That's just fantastic! This innovative and automated eBook store is definitely a must have!